No, I dont know if in Aust. as I've been on the lookout for it too. I havent seen any of those either. But I am now looking for this one, didn't know it is so hard to find it here considering this part of the land is so vast, such a dissapointment . There may be some in our tropic regions that the only people who have seen the plants would regconise the species. I have never seen them before so I can't realy tell if I come acrross one. I was looking for it for a long time but gave up after a while. Does it mean you have the 'suong sam' plant with you? Yes, a friend gave me some SS seeds, I was able to germinate them . They are still too young only 2cm tall. 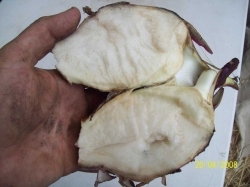 all you have to do is rub the leaves, squashed it up in a bowl of water to 2 handful of the leaves, and strain it to prevent any of the pulp leaves bits got through, and leave it for 1 hour, it will start to coagulate, and away you go with sugar mixture and banana oil with crushed ices. But for mesona chinensis (suong sao) this one you must cooked the leaves in boiling water, until the leaves disintergrated (melt) again strain it prevent any of the pulp get through, and prepared a few of the gypsum mixture liquid, and pour out the cooked suong sao liquid into moulds and leave it for an hour, and it will coagulates for you, to enjoy . Thanks for the pictures and the recipes. I used to buy the ready made from the market stalls. My friend send me 24 seeds, by the time I received it only 19 are viable. I've sown it all, but only 4 germinated. I tell you what, wait until the plant is mature enough, I'll propagate it through cutting and give you the plant. Because my friend told me of the low percentage of seed turned out I didn't believe her until I've sown all that she gave me. I'd think that around January it will be ready after propagation(that is only my estimation, but let's hope) as it takes 3 months for the seeds to germinate . Nguyet, either way, which ever come first,I'll reserve 1 for you. Thank you so much for that. I am very much appreciated. I am so excited because I have not had it for 27 years. I saw what the leaves look like from your picture but have never seen in real life. yes me too, almost 30 years I have not had fresh one either only those from the can, from China hihihi. what is dua hoang kim ? is that some type of melon ? rau s�m đất luộc hay nấu canh đều ngon, ăn hơi giống mồng tơi nhưng h�ng c� nhớt như mồng tơi. My friend just gave me seeds a bit too much I think, I just sown some yesterday, still got plenty seeds left over too . If you want I can send you some . 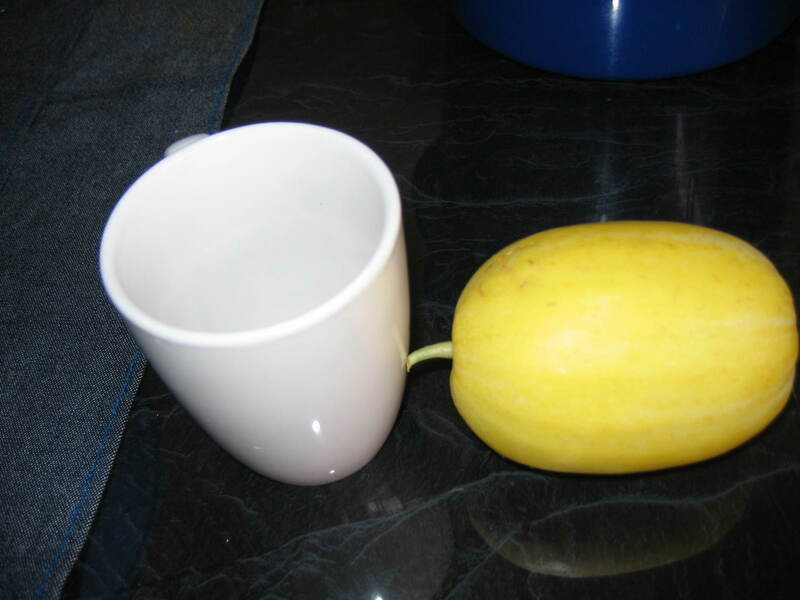 Dua hoang kim is a very small golden yellow melon that looks very much like yellow honey dew, sweet but very crunchy and very small with the biggest is the size of a mug. Another name is Japanese melon. I have never seen them sold in Melbourne. I would love to have some of rau sam dat seeds. I will email you my address. Many thanks. Beautiful flowers by the way. I also have la' ca^m? and la' Gai would you be interested? do you still have my address ? Yes, I still have your address. Just the melon only or including la' ca^m? (the plant) and la' Gai (cuttings) as well? I will send them soon. If you are able to get more seed , or are successful with cuttings I would really like some too if you could. It's another plant I've been searching for. For me, I of know of the Thai ways of using it and would like to grow it to have fresh. It's used to cook Nor Mai Ruak , shoots of a bamboo (Thyrsostachys siamensis) from Nth Thailand. 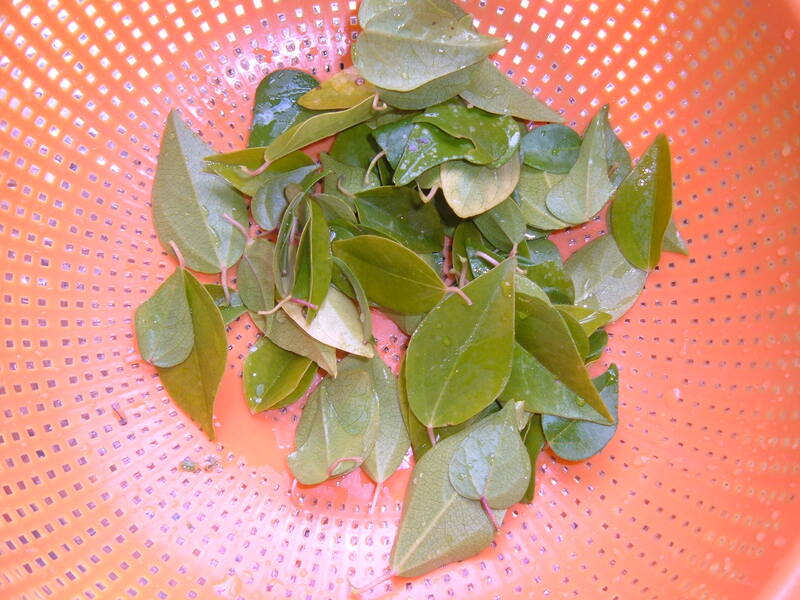 Also used when cooking Khi-leck , leaves of Cassia siamea. I sent the lots this morning by Express Post so you should get them by tomorrow. I also emailed you today too. gosh I am sorry been on the move these past 2 days, haven't got time to the PO yet, but definitely by Monday you should receive the seeds for the other one from me . About La Gai, do I just soak it in a glass of water until it rooting, then planting ? I dont know about la' gai because I have never propagated myself (I was given the plant) so I guess you could try 1 cutting in water and the rest use hormone powder. Don't worry about the seeds you could send to me next week or the week after, not in the hurry, I understand. The la cam plants were not at their best because of Melbourne cold but will grow well when the weather gets warmer. The cuttings can strike easily in water for sure. You look after them, get them established. Good to know they're in the country. let me know if you want to sell or trade. I'm sure I could find something in my collection you'd like as a swap. there is often confusion around this one, some sources suggest that it is Melastoma polyanthum, which is possibly used in the same way. 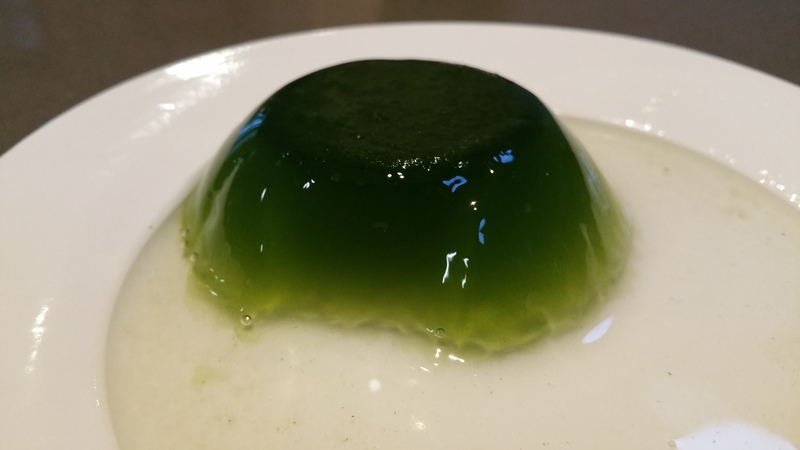 Even an Indonesian book about cincau (grass jelly) that I have states that it is Melastoma ,but illustrations and photos clearly show Premna oblongifolia! Ellen and Nguyet, if I manage to locate these, I'll let you know and you can get first dibs on cuttings, divisions, seeds etc. Better to have six eyes looking than two eh? Here's a like to see the book. I got is about 10yrs ago in Indo, now aparently out of print. 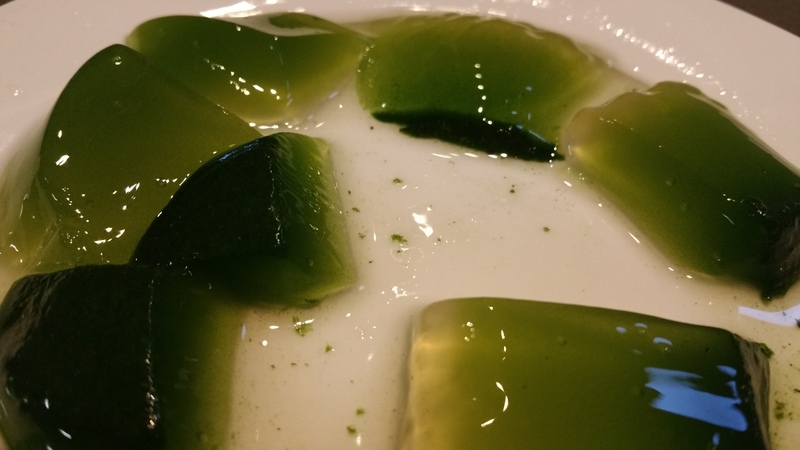 Obviously, there are more than one edible species of grass jelly plants. My brother has tasted the grass jelly in Indonesia and he said it is very much like the one in VN and it was made out of leaves of a vine so now I don't know should I look for the vine or ground cover or small bush. Anyway, It is very interesting what you wrote. I will definitely keep an eye on these plants and will let you and Ellen know about my discovery (if any). I wonder if the book has an English version I would buy it. 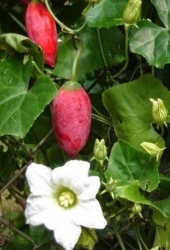 Stephania and Cyclera are both vines and the Premna is obviously a shrub. 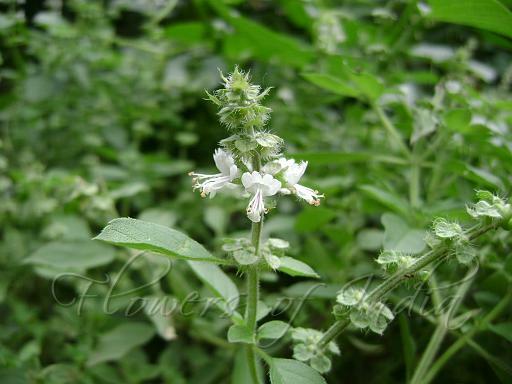 The 2 species, M.chinensis and M.palustris (may be synonyms) , mint like herbs. those and the Yanang vine plus Melastoma polyanthum ( I'll have to investigate this one a bit more, it occurs naturally in Aust), make up seven possible species. If I had a chance to have any or all, I would, as some of them possibly have different medicinal or other nutritional benefits. For example the Cyclea barbata roots contain an alkaloid Curine similar in action to tubocurarine a strong muscle relaxant used in "Arrow poisons" of Amazonia , but sourced from another species of vine from the same family. Curare was one of the first anaesthetics and still has uses in medicine today. 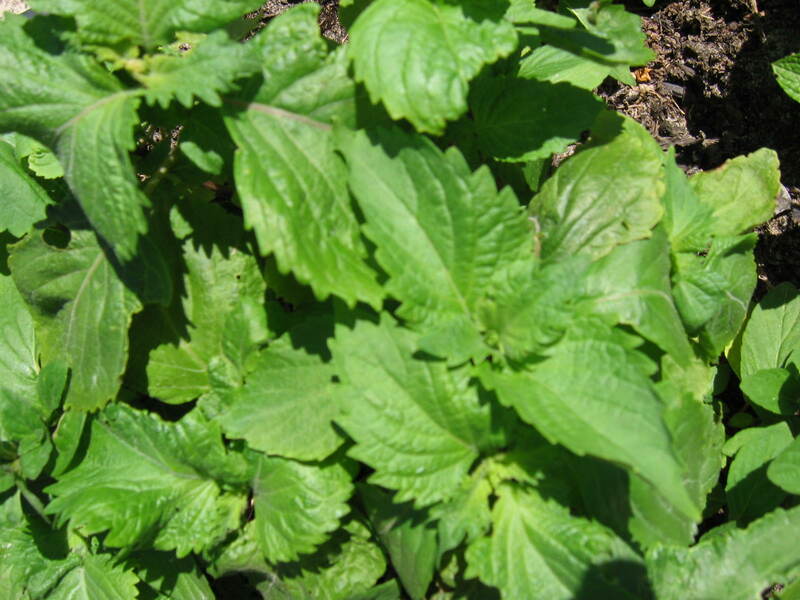 Cyclea peltata , a close relative is used in Ayurvedic medicine for treatment of kydney stones. So look for all of them and get what you can. That's my approach to it. I could get the book photocopied. It has 62pp.but only need 25 pages for the most important stuff. If you have a friend who reads Bahasa Indonesia, they could translate recipes I guess. Many thanks for your valuable details. Much appreciated. I will collect all information and develope some photoes from the web of those plants/vines in preparation for this going north trip and see if I can find any thing. "If you're trying to root the cuttings in a jar of water, simply put the willow and/or ivy into the jar. These plants produce rooting hormones as part of their own rooting and the water will soon be full of "natural" rooting hormone"
The cuttings of la' gai you gave me, after I received it, I put it in a cup with rooting hormone liquid, but the next day the tip of branch went dried-black, my husband thought it was the kids play thing with the plant, so he chucked it out in the rubbish. Well no Christmas present for him this year, hehehe the bugger. Yes, I totally agree with you about the Christmas present. I am testing this method with a couple of la' gai cuttings and see if it works or not. Anyway, no matter what happens, I will send you some if it works or I will dig some rizhome or both, also with the la' Ca^m? as well if yours are not working well. Will send to you in January. Not a problem. Would you like me to send you the seeds or the plant cuttings .? The seeds I can send right away, as for the x.xAM cuttingS, that won't happen until after Jan as the plants are still too small. I was amazed at how well the X.Xam young plant could handle the summer heat. Last week we had 37 degree C, even the young shoots from my a.muricata wilted but not the baby X.Xam, and it was sitting in my poly house. what is bai khaprao ? Excellent! yes, I would love some of the seeds because it is much easier to send and survival rate is greater than cuttings. Many thanks for that. Much appreciated. Good to hear that they handle the heat well. BTW, bai khaprao is hung' que^' an pho?. Thai basil is that right Reville? Take your time. I will wait. 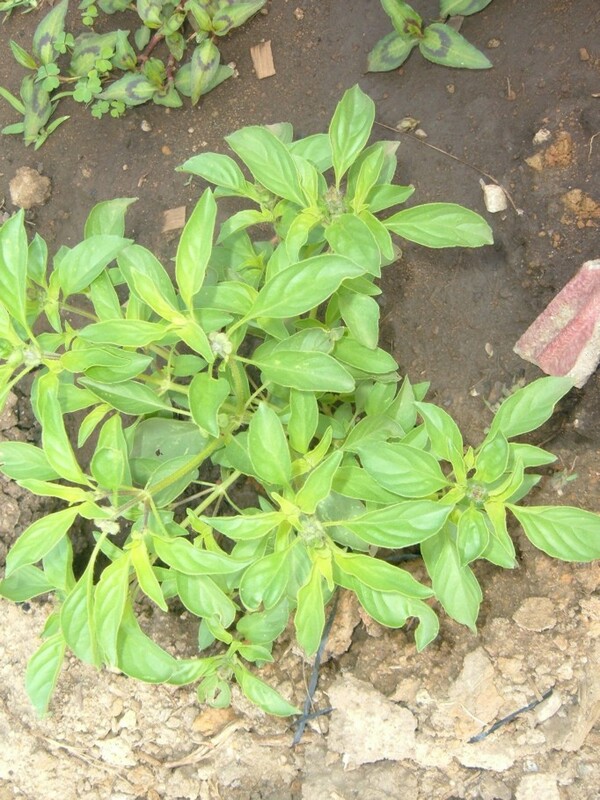 Bai khaprao is 'sacred basil', it's a hairy leafed one. 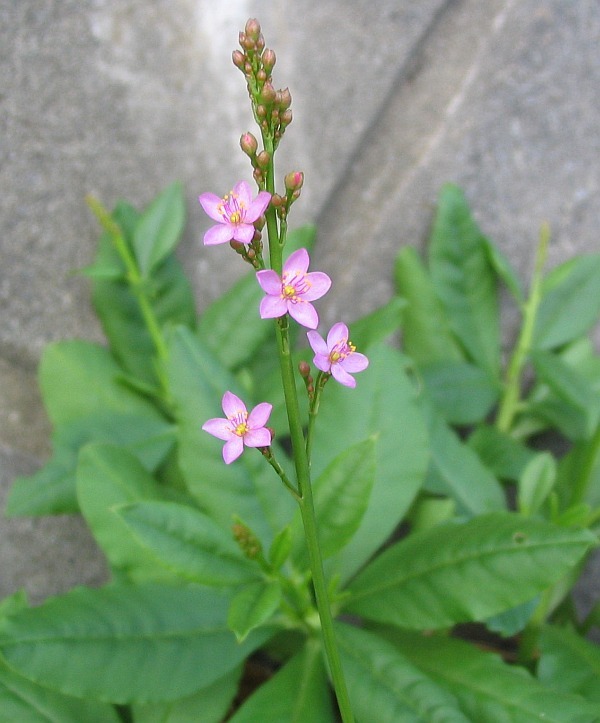 Bai Horapa is purple stemmed , Anisey scented one. I think hung'que is this one? Basils are a bit confusing, many years ago I thought I had them all sorted. I have some fesh Cha-om (Acacia pennata var. insuavis) seedlings I've just germinated. I picked the seeds myself about a month ago. do you have pictures of what they look like? All this botanical names I sometimes just forgotten their everyday name for it and its uses, until I see their form. but here are some from the net. Cha-om is used in Thailand, Myanmar and I think Laos and Cambodia. Often, but not always, cooked with eggs. I also have Rau Manh Bat (Coccinia grandis) if your interested. Known in Thailand as Tamleug. 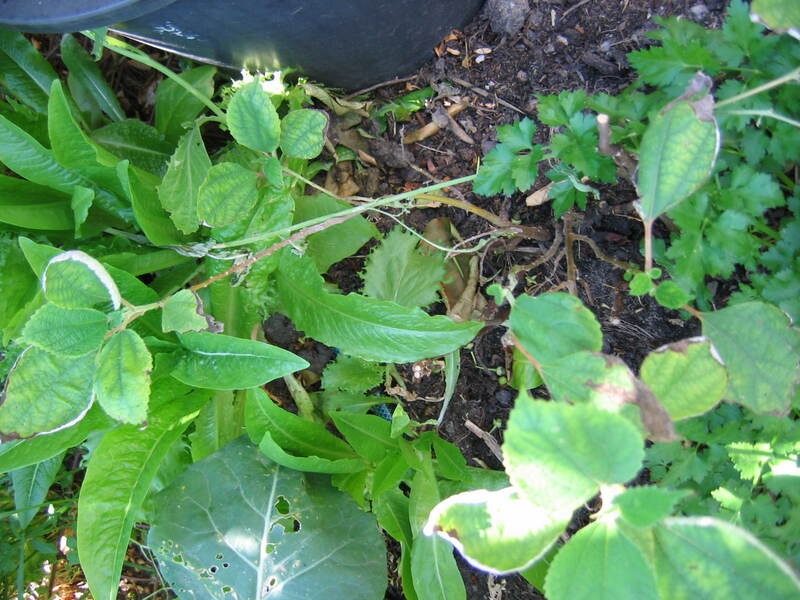 Fruits edible (ike little cucumbers) and so are the young shoots. in India they're known as Tindora or Tindola and used in Sabzi or Sabji and vegetable curries. If you want one I'll start some cuttings. Very kind of you in saving me some. Much appreciated. I have sent you an email. So sorry, went to the PO yesterday but forgotten the seeds. (That what happen when one have too many things on the DO LIST, and not enough TIME on hand). So I did picked up a couple of those priority envelopes mail, as the PO man told me those are for the next day delivery service, So I'll drop it off 1st thing Monday morning, by Tuesday you should receive it. If you're going to plant it right away . The Talinum seeds can goes straight into the ground where ever you want it to grow . is the coccinia grandis cutting easy to strike root ? Let's share the blessings around. On Monday I'll send the X.Xam seeds to you when I send Nguyet's out to her. If I may, then I will choose the coccinia grandis seeds instead as I am not so good with cutting if they don't already have any roots or root eyelets . BTW, have you ever try Lemon Basil - h�ng x� ? The Laos, and Cambodians loves them, only a few Viets like them or known about them. I have never heard of lemon basil, is that the same as kinh gioi? I would love some if it is not king gioi. BTW, I have tia to xanh,king gioi seeds and ta^n gia^y la' for 'nau canh chua' if you would like I will send you some too. No Nguyet oi it is not the same as Kinh Gioi, but better than Kinh Gioi, as Kinh Gioi is classified as one of the rau with nhiet property. OK I'll send it too. I don't have the tan giay la for canh chua yet. Is it easy to grow? Yesteday I've went to the market nho X.Xam qua bought one in a can, I've put it in the fridge. Thank for the lemon basil. 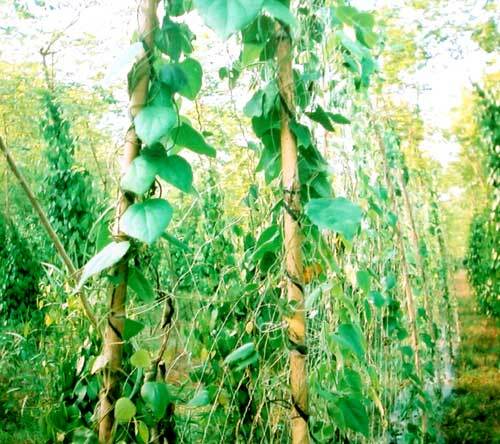 ta^n gia^y la' is very easy to grow and the leaves are used for coughing treament also. I will send you some with the la' gai when the la gai ready. I know that there have been some fake SS in cans so I have not bought any in Asian shop. Fresh is the best. You will have some eventually. Many thanks for the instruction of the ss, I will follow your advice when growing them. I am so excited. Sorry that you had to go backward and forward to get bags to send me. Many thanks for taking time sending those seeds to me. I am very grateful for that. OK I'll try the T�n Giầy L� . Thank for the picture. I have only noticed the hung que an pho and never know that there are some good herbs out there that I have missed out on. I used to have rau rut' nau canh bun but too cold and they did not make it. REally?, where can one find Cũ �u ? Also T�a T� Xanh is this T�a T� Xanh that you meant, Nguyệt ? 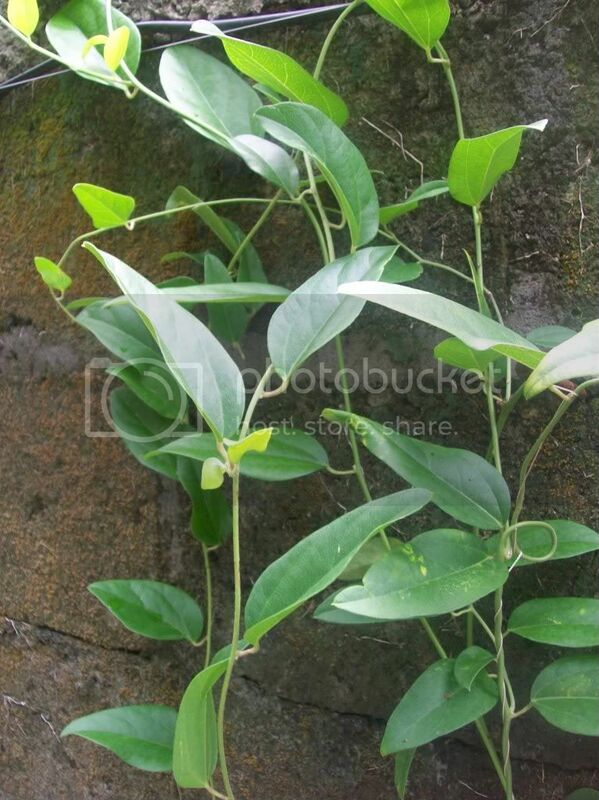 T�a T� cuttings can be grown easily up hểre Nguyệt . H�nh dạng rau r�t ra sao vậy sis Nguyệt ? 1st time I've heard of this rau r�t . Cu au is a water plant called Water Caltrop and in NSW it is a weed. I have never seen sold in shop but a couple of website said so. rau rut, Rat thom when add to canh bun or canh chua. 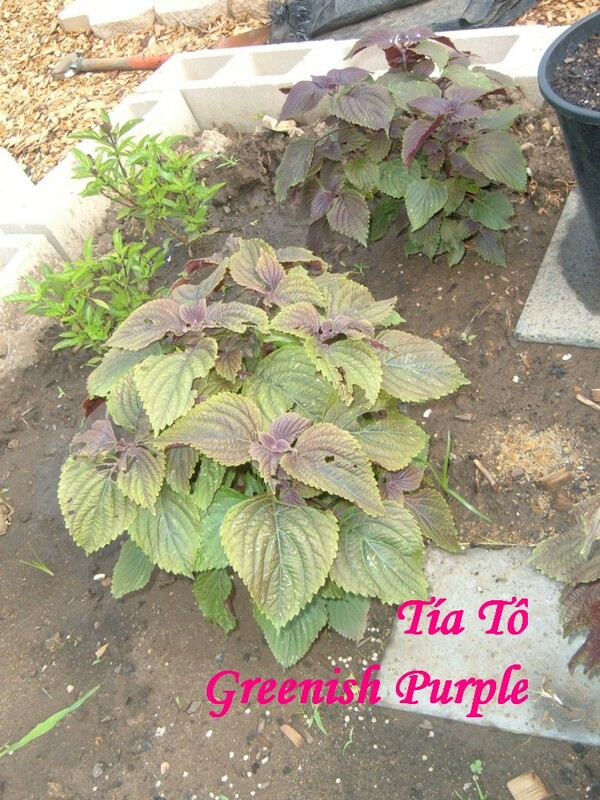 Tia to xanh looks exactly the same in the photo but green another name is shiso, it is a Japanese variety. I have plenty of seeds. Leaves are much bigger. rau r�t, also known as rau nh�t very good for lẫu canh chua, lẫu mắm or use as rau gh�m cho mắm kho . How I wish I could have some of it .hihihi . I don't ever see them in the markets down here . Rau rut known as 'Pak kachet' in Thailand. Last time I ate that was in Thailand in 1990. I haven't seen it in Aust. But if I did find it I'd start eating it for sure! from Thailand where it is known as 'Bai maenglak'. I was introduced to Quế X� (Chanh) 20 yrs ago, back in Canada by a family friend, they are Laotian . We would use them to wrap in rice paper with rice noodle and pickled prawns (mắm chua t�m), so scrumptuous . Have you got it yet?, If you havent' got it, let me know, so I can track it down . Ellen , no not yet but I expect it tomorrow morning , 8:00am. I'll email you if it's here or not. Stromung, I'll copy it for you but it might take a bit to get it organised. holy smokes, hahahaha. It's about time, a bit over due on arrival, but as you'd said you're not in the mainstream location, perhaps that is where the held up was. Yes, It was probably at the PO in town yesterday but mail isn't delivered to us on Thursdays. No worries though, the water they're soaking in is now purple. I'll change the water and sow them tomorrow. I am longing to try them out in cooking. It's so much better when you can use fresh ingredients. If you have any Rau Manh Bat plants I would like to buy one of those as well! I don't sell the s.sam seeds, since I received it for free out of a very generous heart of a sis named HAmVui in the state, therefore I share them just the same . If you want, contact me on yahoo, and send me a self addressed envelope, and I'll send some to you Violet. what is rau manh bat ? as I have only a small plant and have to do more cuttings. Ellen yours is on it's way soon. I'll let you know before I sent it. 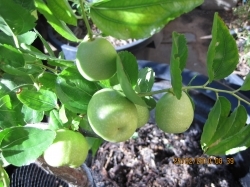 1) Does anyone know if, when growing Suong Sam in cool climates such as Melbourne, do you have to grow it in a pot and bring it indoors in the cooler weather over winter? 3) I have searched everywhere to find the botanical name of la gai, but have not found it. Anyone know? I hope you might like some of the seeds I've mentioned. Ellen, is this h�ng x�? yes the flowers looks similar to Thai basil, but the branch is not dark burgundy color. Does it have lemongrass scented ? The Lao's people they have a similar looking plant for lemon basil too, however the leaves are a bit longer shaped. And it is too strong scented of something else. And most often the Viet's people mistaken it for lemon basil. Personnaly I was not too keen in trying it out. the picture of lemon basil look alike plant you've posted up, is that yours ? If not and you would still like to have some seeds for the lemon basil, then I'll send you some, just got fresh batch from my garden. as for King Gioi, I don't have any stored seeds, and the plant that spreaded in my garden is still too young, usually in winter that is when the seeds would mature. But Kinh Gioi are very easy to propagate through cuttings, when you buy them at the shop, just choose are really old stalk, and soak it in a glass to water ,for a period of time, and the roots will come, then you just plant it.Remember to change water every couple of days, otherwise it will rot. Chi Nguyet still probably still on holiday. The La CAm she gave me, it had dried out and died during those heat waves days up here. I found the picture on the Internet. I do not have h�ng x� myself, but I would like to grow it and would very much appreciate some seeds, thank you! I'll send you an envelope. 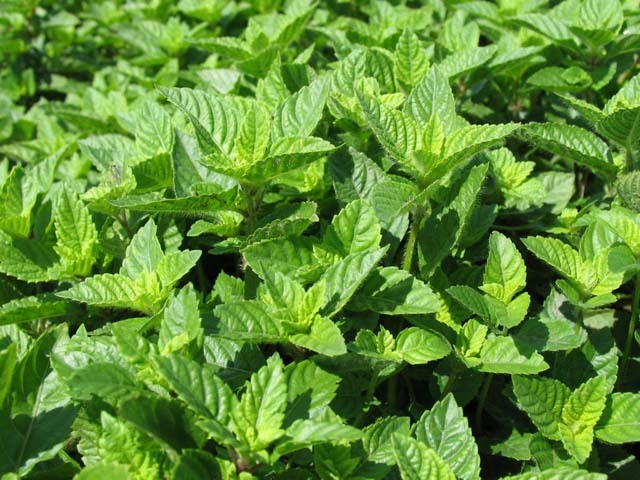 I have done some research and (I hope I am right) - I think that in English h�ng x� has many names including Lime Basil, American Basil, Hairy Basil, Hoary Basil, White Basil and Hoary Tulsi. I think maybe its Latin name is 'Ocimum americanum'. I found a web site that said "It has a nice lime flavour and is mostly eaten raw as a garnish; its fresh citrus note goes best with fish." Thanks for the tip about growing Kinh gioi. I'll give it a try. What a pity the la cam didn't make it through the heatwave! I would love to use some to make b�nh da lợn and x�i l� cẩm. Are there any seeds on my list that you would like me to send you? no sweat it, when your envelope arrives, I'll drop in some lemon basil, and dua hoang kim seeds for you, left over given by Chi Nguyet. On your list, may I have seeds for so dua, Chi Nguyet gave me some, after soaking it for germination I've found there were hole through them (eaten by bugs). BTW rau S.Sam takes almost 3 months for germination . So don't get dishearten. You can easily get the SSam plant from this website in Canada and in USA too. and so this one?is Suong Sam? aka Ya nang? my gosh you're at the center of SS woman, there is an oriental (Viet Buddhist temple in CA, one of the monk there is selling the plants,,,,not only the version i got, but also the other authentic version as well. the one in the picture from photobucket is the one growing in my backyard.,I would love to get my hands on the other hairy one though. the pic from photobucket which REV uploaded is on his link which posted just above my post. And that's the one we got Chi Nguyet, btw how's yours SS Chi Nguyet? Mine are doing very well in the laundry. They are going up the trellis now and look healthy. Thanks to your Generosity. I can't wait for summer so I can take them out and hopefully harvest the leaves. Mine are doing ok too Ellen , thanks. they're in the shadehouse all winter so far and I measured -2degC and no damage at all. more than I'd have thought. Mine, I had 5 plants and 3 of them I've put in ground out in the garden, 2 i still left it in pots and in the hot house. Surprisingly, the one in pots didn't take off as much. Like the one in ground in the garden. 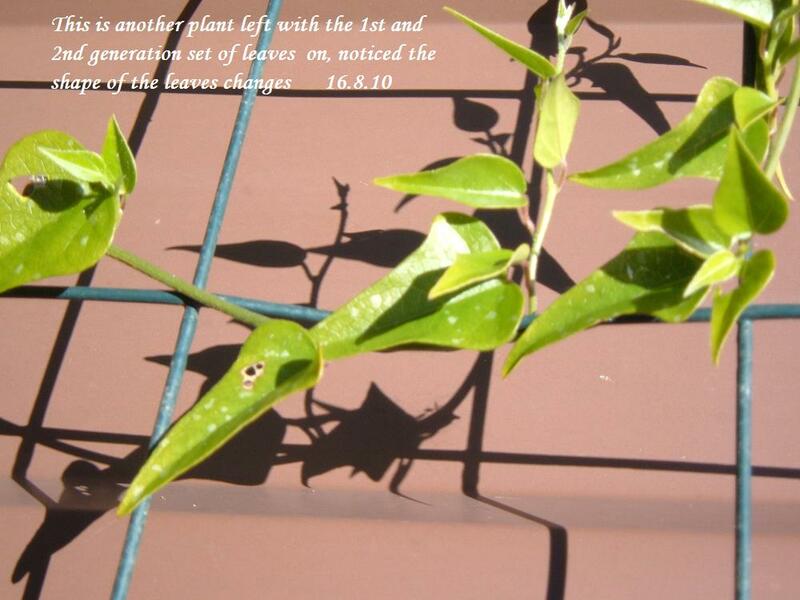 And to my surprise, I've picked all the leaves off 1 plant, and now it had new leaves but the new leaves has shape not like before but like those in the pic above. Take note of the shape changed in the leaves as the plant is maturing. Yes, after the 1 or 2 sets of leaves been discarded, the 3 set of generation of leaves can grow very big ,3 to 4 times the size of the 1st generation of leaves. The more you take care of it with watering and give it enough nutrients (fertilizing) it can get quite hefty growths there. 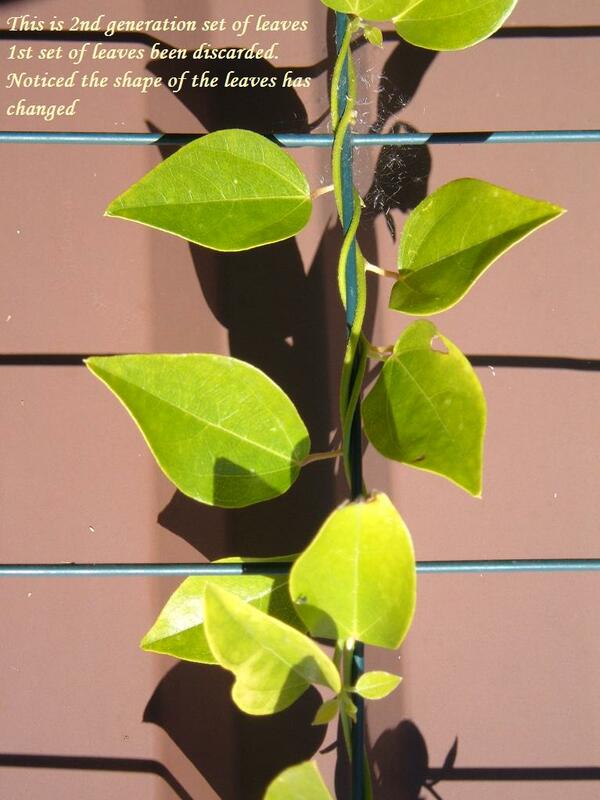 And it is so easy to propagate through the vine too. Just stick it in a small pot from the vine, try closer from the main plant, but don't cut the vine off from the main plant,,,and water it daily, after 3 months or so you can then cut it off from the main plant, by then it should have grow independently on it's own, no need for root hormone dusting so forth. Thanks for the good tips Ellen. Do you sell to Perth? I had to used 2 handful of leaves, after I washed them. I crunched them up. I think next time i'll try to grind them in the blender, then sieve them through a cheese cloth would be quicker . I am very jealous with you. I wish mine was as big as yours so I could pick some leaves and we can share the fun. Thanks for the recipe too. I must work harder to made my plant grow stronger so I can have atleast 2 handful of leaves. I can't wait, you make my mouth watering now. Thanks. Does anyone have Coccinia Grandis known as Tindora, plant or seed for sale? I just found this forum, and would like to share some tips to you, In the winter I use warm water to water my plant and use clear plastic bag to make the mini green house for my plants and they grow very nicely, you can try, also pick the to leaves off if you plant have more than 3 knot leaves that way your plant will grow more leaves. Use the peatmoss to progate seeds or cutting you will sucess more always make mini green house for new seeding and cutting. Thanks Thuy for your tips. I wish I could find ss in Australia. You're so far away from me, i've ran out of seeds, but i still have 2 plants left over that is still in pot from last season i've left over from propagating from seeds. Yes Wow what a string - I would love some Okinawa spinach seeds, plants. Can I have some cuttings of Coccinia grandis please? I love the vegetable. I am happy to pay. can i have some Tindora cuttings please . i am happy to pay . Please send me a reply ASAP .will keep waiting for ur reply. I am happy to give you my other Asian plants or seeds if u are interested. My plant died, but I may be able to get more. I'll let you know if I get more. What is indian beans? is that the one they call Avarai? i would luv to have them. Have you got the tindora as well? I am happy to pay Roni. Hi Nguyen, I think it might be okra. Yes its is Aravai. I have planted all the seeds for the summer. I will save some more seeds from the beans that i will get this year probably by end of April. I will let you know once i save some seeds. I dont have any Tindora though and i am trying to get that badly . Please let me know if you find the tindora plant anywhere. are you in Canada? If so there is a shop in Montreal (I think) they're selling all kind of asian varieties of plants and seeds. 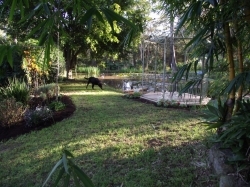 I have just ordered some green grass jelly seeds from a guy who grows the vine in QLD. I can't wait to grow and make my own authentic grass jelly like the one I used to eat when I was young. I was told that this kind of seeds viability is 7 days and I am on the waiting list. Kim that link that you've posted up, it doesn't say specific . And the guy in QLD that you're ordering it from, which one does he have? the black one or the green one? He guarantees to me that is the green one. I wanted to buy from the above link but the owner said he can't sale the seeds because of the viability is only about a week. I am over the moon to get it from Australia. I will get mine next week. Kim: thank you for the lead. the link of SS in floraexotica,,,from the pic, look like the same as those one we have, not the superior kind dear. Don't waste your money Sister. It's take long time for the hairy SS to germinate. I started from seeds in October last year and only one sprouted. Now it's about 7cm height and quite hardy with the cold weather in Sydney as I leave it outside on the balcony. I finally got my SSam plant in SanJose for $16/gallon. I guess I'll have to wait for a year to make my first 'homemade ssam'. I've recently read about the hairy SSam and not able to find any over here yet. I planning to look for them in October when I'm down in the Garden Grove area where most Viet lives. I didn't want to buy anything from floraexotica because their prices are way too high for me to buy and shipping is also steep. @thuy, hopefully you'll check back on this forum. Were your cuttings successful? I'm thinking of doing cuttings so I'll have a lot of ssam leaves to make ssam with. Does any one have Tindora plan? Uma & Rony have you found one? If yes, would you like share? I will be delighted to pay for the cutting + shipping & handling. I am appreciative of your help. 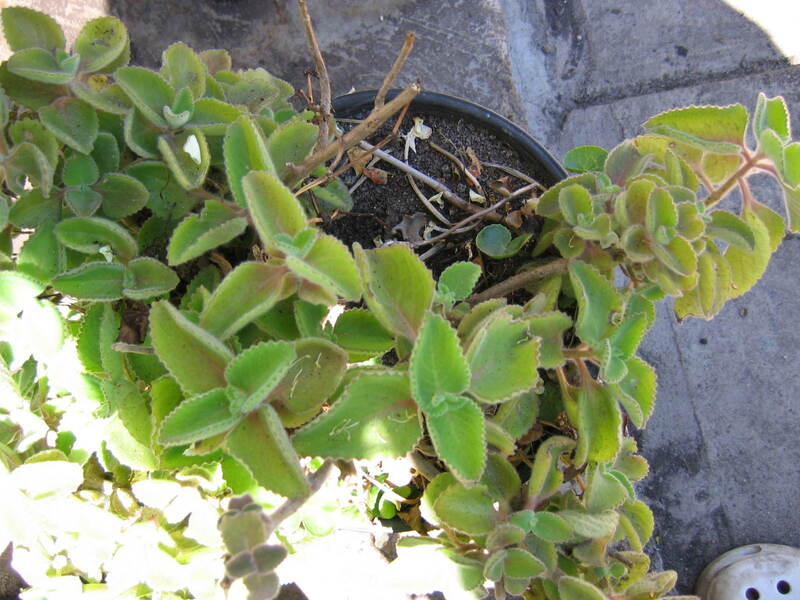 Currently, have you grown the Tindora plant? yes, but they've died off for the winter. I expect they'll get growing again soon. I could take cuttings again in summer when they're growing strng and develop a bit of thickness in the stems. C� cho con xin l� sương s�m, l� gai được kh�ng c�? Con ở Brisbane. I saw your discussion with Nguyet and Ellen. I am looking for cincau plants (suong sam) and found this forum. Can I get a copy of the bookd? I can read Bahasa Indonesia. I'm looking for cha-om seeds. I love eating cha-om omelettes :) Do you have any? 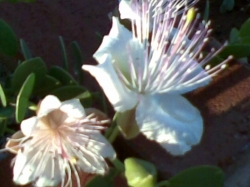 Chah-oom is hard to strike and rarely sets seeds in Australia.It would struggle in Melbourne. smooth leaf leaves a couple of days ago. It took 12 hours to start gelling and another 12 hours to fully set. It was just a trial thing, I'm guessing more leaves will maybe set quicker. I didn't have so much luck with the hairy leaf version though, maybe I didn't use as many leaves or crunch them up as much, not sure, but I'll give it another go. Someone tells me to mix the smooth leaves and hairy ones together, Suong Sam will be nicer. Thanks for the tip Thao, I need all the help I can get. My friend from an Asian shop at The Entrance said to use one drop of dầu hoa bưởi, or AMYL ACETATE. I can't remember if I add it after the jelly has set, or during setting time. You add dầu hoa bưởi from the beginning but it's not necessary. The important thing you should do is to let all the leaves wither before you start. Harvest the leaves, wash, dry and leave them until they're withered, then you can make Suong Sam. Hi JohnMc1, I came across this post as I am in search of the Yanang plant, Can you please let me know where I can buy the plant or fresh leaf? Or anyone that have suong Sam cho mình xin ít canh về trồng. JohnMc1, when you do add the banana scent , it should only be add to the sweet syrup which add on later onto the finished product of the jelly in your glass or serving dish, with crushed ice. I am also looking for either of these plants - if anyone knows where I can get please do.oet me know, I'd very much appreciate it!